Today saw something special for Beijing by Aquarius. A special limited edition with taste of GOLD tropical. The taste of it is quite nice and easy to drink, bit of grapefruit taste. 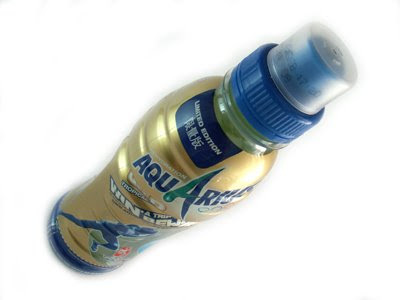 Also really do like the blue and gold color scheme, but I am not fond of the Aquarius logo, what I like to call the logo is Aqu Arius. I call it that because the A in the middle cuts off the word into two pieces, which isn't really a nice flowing design. On the bottle it says in Chinese Limited Edition but not sure why they did it though because the bottle is only available in the Netherlands, Belgium and Luxemburg. Also they added a special contest where you only have to type in a special code you can find on the bottle and win a golden medal worth 200 euro. However the limitation isn't that they made only a few but that it's only avaible for this moment for the Olympic games and availability in only some countries. The design is printed on a shrinkwrap and printed all the details first and then layered up with gold and then finished up a coating of white so everything would not be transparent. Main colors are dark blue, gold and white, plus full colous for the olympic rings and the Beijing 2008 logo. Actually really don't like the bottle shape at all plus the logo. Actually the Asian or Japanese design is much better than the European version. I am actaully not sure if they actually sell this drink in China because I only found they are sold in many European countries and Japan. You can compare it yourself with these website the European site and the Japanese site. I am not sure why but lately see that every country often has it own design and not everywhere the packaging for the same product is always the same. Just like it is tailormade for those countries, however you see some countries really get cool designs while others get damn ugly one. For me this sound very odd even for major companies like Cola Cola.